We now have an indication that the Coast Guard may be following the Army and Marine Corps in replacing the M9, 9mm, made by Beretta USA. with the Sig Sauer Modular Handgun System. Unit cost is $180. We do not yet really know if this is a move to replace all the Coast Guard’s hand guns or only those for select units, but there may be reason to believe it will be a wholesale replacement. . 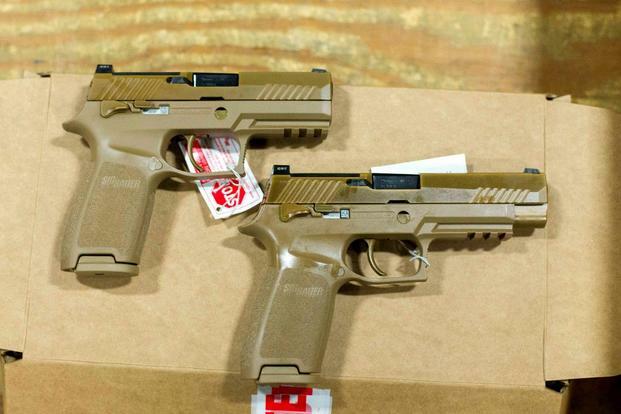 The Army’s 10-year MHS agreement calls for Sig Sauer to supply the service with full-size XM17 and compact XM18 versions of its 9mm pistol. The striker-fired pistols can be outfitted with suppressors and accommodate standard and extended-capacity magazines. There is also an accessory rail for mounting accessories such as weapon lights. The problem with the USCG is that they use the .40SW and not the 9mm, and that they already replaced their M9’s 13 years ago with the Sig P229.